This is a photo of Long Island CORE member Jon Moscow as a high school student. He was a member as early as 13 years old and participated in numerous actions including the summer of 1963 sit-ins at City Hall and Governor Rockefeller office. By 16, he was Long Island CORE's housing chairman. 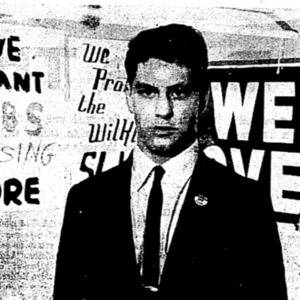 Sussman, “photo of Jon Moscow, Long Island CORE, as a high school student,” corenyc.org, accessed April 18, 2019, http://www.corenyc.org/omeka/items/show/295.